This is one of those fantasy books that you hear about for years and wonder if it’s really worthwhile. 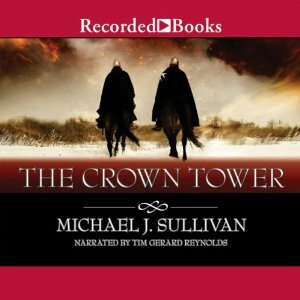 It’s been on several “top” lists of fantasy book and I finally purchased it from Audible and took a chance. I’m glad I did. This is the first book of what is actually a prequel series to Sullivan’s “The Revelations.” I’d heard that you can read the two series in either order, chronological or published, and still enjoy them. However, most of the reviews I’ve seen have been by those who’ve already tasted the pleasures of Riyria in the first series. I started the adventure with this one. Maybe I thought I’d be different, but mostly it was because this one was on sale first. There are many interesting characters in this book, but the two biggies are Royce and Hadrian. They’re very different personalities. It’s easy to like bad-boy-with-a-good-heart Royce, but Hadrian is another story. He’s secretive, dark, and deadly, and I didn’t really like him at all until the end of the book. It took Royce that long to get used to him, too. That speaks well of Sullivan’s writing talent and his ability to develop characters. This pairing is definitely an odd couple relationship, and the bickering is part of the fun. Yes, there’s plenty of humor, even some laugh-out-loud sections, but there is also death and oppression; after all, the two main characters are thieves and assassins. The author makes an effort to equalize the environment, and in my case, he succeeded. I wasn’t overwhelmed by the dark side. One part of the story in this volume that I thought was too long and involved was that of Gwen, a prostitute with a heart of gold. It didn’t seem to mesh with the rest of the book, and it takes a very long time indeed until we see any interaction. I assume this story will continue in future volumes. The book ended well enough and yes, it does compel you to read the next one. However, it is NOT a cliffhanger, which seems so prevalent these days. I do intend to continue the series and may even skip to “Theft of Swords,” the first volume of The Revelations. The audio book was exceedingly well paced, and Tim Gerard Reynolds is now on my list of top narrators. I love that my introduction to this author was so well done in audio format, as I now have voices to go with the characters, no matter which format I choose.